As you enter your second garden season in your new SIP you may find yourself in a bit of a quandary, especially if you used a retail potting mix in year one. What should be done with your old potting mix? Is it still usable? Does it need refreshed? KEEP YOUR MIX CLEAN: For your SIP potting mix to remain viable after years of use it must retain its water wicking attributes while maintaining good pore spacing for healthy aeration of plant roots. Unlike in-ground garden soils that are mineral based, there is no need for incorporating excessive "organic matter" in the form of plant waste. After each harvest it is best to pull out large plant roots, shaking off the dirt. Compost the roots in a separate location. Artificially aerate the soil by fluffing it with a rake. COMPACTION IS THE ENEMY! Over time, large particles will start to break down leading to compaction. To compensate for this it is good to add components that will improve soil structure as needed. Perlite will boost aeration if the mix seems too moist. Pine bark fines can help to maintain good structure over time. An important note about wood products in potting mix: Nitrogen draft may occur, requiring additional nitrogen supplementation. To minimize this effect, use dark, outer bark pieces (higher in lignin) which tend to break down slower than light inner wood. Look for aged or composted barks as these are more stable resulting in less N draft. If you add these to your old SIP mix, be sure to mix them in very well. TOPPING OFF WITH PEAT MOSS? Adding fresh peat moss is usually not needed. By itself, peat moss is prone to compaction. As potting mixes get old, compaction becomes a growing concern. So, unless your soil wasn't wicking well in the previous season, don't top off your SIP with pure peat moss. It's ok to add some if it is included in a complete potting mix which would include perlite and possibly wood products. Tossing in a fresh bag of potting mix is an easy way to top off a planter that has settled over the season. BAGGED COMPOSTS? 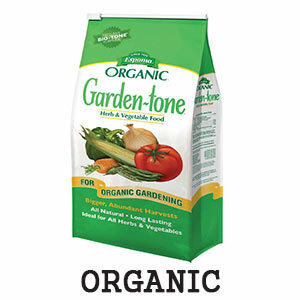 To prolong the viability of your SIP potting mix, it's best to replenish nutrients in the form of fertilizers. Organic gardeners are apt to use compost as often as possible. 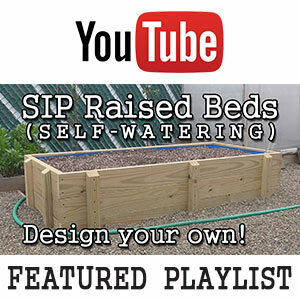 In SIPs, worm castings can be included in small amounts. But using composts in containers can yield unpredictable results. Bagged (retail) compost, humus or manure might have a fine consistency, similar to garden soil. If it contains fine silty particles then this can reduce pore spacing and aeration properties of the mix. That's why topsoil is NEVER recommended. As air gaps get plugged up by ultra fine particles, compaction occurs. And since SIPs are always resting on a perched water table, the few remaining air gaps tend to be saturated with water. This impairs root health, preventing plants from getting the oxygen needed at the root zone. This can lead to a decline in plant growth, or even root rot and death. Even if plants grow ok in the first year, over time the potting medium may break down to the point that it must be replaced. HOMEMADE COMPOST? Buying bagged compost is not financially advantageous in large beds anyway, not when compared to buying a bulk organic fertilizer. Of course, homemade composts might work, especially if they are mostly wood based. These tend to have more structure. Larger particle size means improved aeration. I've found though that it's very easy to reserve my compost for conventional beds and perennial plantings. It all gets used, just in a different location. LIQUID FERTILIZERS: It's possible to sustain your plants through a regime of only liquid feed throughout the season. However, I don't recommend treating your SIP like a hydroponic system. Liquid feed is ideal as a supplemental nutrient source. It is good for boosting nutrients in the event of a soil deficiency or in mid-season when fertilizers have been depleted. Some gardeners will use foliar applications on plants like tomatoes or peppers at flowering or fruiting time to improve yield. Liquid feeds are best when applied to the leaves (foliar) or to the upper surface of the soil as a root drench. I don't recommend adding fertilizers to the water reservoir directly. There is no advantage in bypassing the root zone of your plants. DRY (GRANULAR) FERTILIZERS: The easiest way to supply most or even all nutrients for the growing season is to simply use dry fertilizers. These might be in powder form, but I prefer slightly larger granular particle sizes. 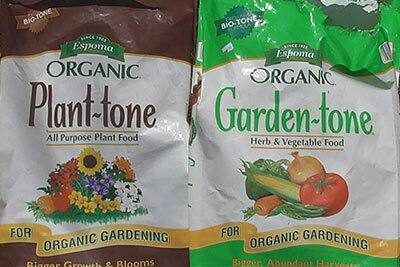 Fertilizers like Espoma Garden-Tone have tiny chunks that release nutrients more slowly throughout the growing season. It is organic and not a true "time release". Even still, I've seen great results over the course of several months, especially when part of it is applied as a fertilizer band.